No, this is not the story of the German theoretical physicist who figured so prominently in Michael Frayn’s 1998 play “Copenhagen,” but rather a theatrical two-hander about two wildly mismatched people – a loopy, talkative oddball 40ish American woman and a taciturn 70-something Irish butcher -- who meet on a London train station platform after she impulsively plants a kiss on his neck. Aspects of the story of this unlikely, illogical and random pairing do metaphorically reflect the physicist’s uncertainty principle. But otherwise, any overt reference to quantum physics is happily absent. At 80 minutes, this is a totally engrossing love story – alternately humorous and sad – with two superlative performances. 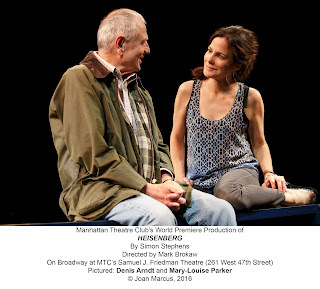 Mary-Louise Parker is at the top of her game as the gregarious, vulgar, compulsively lying but somehow endearing Georgie, and Arndt, resolute and stolid, is equally impressive in a more impassive way as the lonely Alex whose only love ended decades earlier when his fiancée walked out on him, and who continues to mourn the sister he lost as a child. It would be wrong to reveal more of the plot as each moment of the play brings new and subtle revelations about Alex and Georgie and their lives. And we’re kept forever guessing as to whether Georgie is a stalking schemer or genuinely smitten with the older man. The play is the work of Britain’s Simon Stephens who so finely adapted “The Curious Incident of the Dog in the Night-Time.” Much of the touching humanity in that work can be found here as well. I didn’t see “Heisenberg” in its Off-Broadway run last year, but small-scale though the play is, and spare in Mark Wendland’s scenic design -- a couple of chairs and tables is about the extent of it -- the addition here of upstage audience bleachers narrows the Friedman Theatre’s playing area, and creates the requisite sense of intimacy. So, too, Austin Smith’s lighting and David Van Tieghem’s sound design contribute to keeping a focused playing area. Director Mark Brokaw – last represented on Broadway with “Rodgers + Hammerstein’s Cinderella” -- directs his actors with exquisite sensitivity and keeps the humorous and serious elements always in perfect balance.